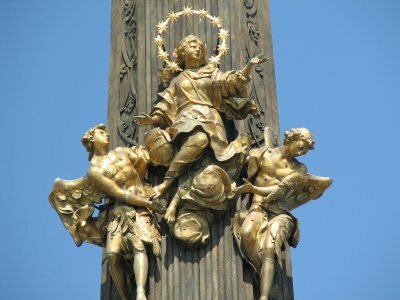 The Holy Trinity Column in Olomouc is a work of art celebrating the power and glory of the Roman Catholic Church. Its construction started in 1717. The total height is 35 meters. The column is the work of the master stonemason Václav Render, who designed it and mostly paid for it himself. After his death in 1733 he left his fortune to the city of Olomouc. The artist Ondrej Zahner finished his work between 1745 and 1752. The column is the most splendid example of a Baroque column construction craze all over Central Europe, which started out with Plague columns decorating many town centres in the 17th century and later turned to Trinity columns. Olomouc is a sprawling city in the east of Moravia. I went there by train from Brno, the ride takes about 1.5 hours. Many of the cobbled streets in the historical center were being restored at the time of my visit, giving a first impression of a huge construction site. On my way to the central square where the Trinity Column is located, I passed a very pretty yellow Baroque church which wouldn't look out of place in the Brazilian capital of Baroque Ouro Preto. Entering the main square, there was a "Wow"-moment when I noticed the column for the first time. It stands higher than the surrounding houses (but not as high as the nearby church). The column is like a clutter of sculptures. Various saints and biblical figures can be recognized when one comes closer. In those sculptures there also is a parallel with Brazil, this time the work of Aleijadinho in Congonhas. 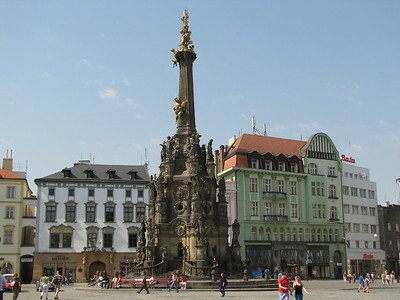 At first instance, not only the Holy Trinity Column but also six baroque fountains and the Marian Plague Column from the same period were proposed for world heritage status by the Czech Republic. However, it was decided by ICOMOS that the latter were not remarkable enough to merit that status. They are worth checking out though when you're in Olomouc. The Plague column is a more sober version of the Trinity column. And the fountains all have their pretty sculptures too. I have to thank Czechia for adding the Holy Trinity Column in Olomouc in the World Heritage List, before the inscription I have seen many similar columns in many places in Central Europe, but had no idea the meaning of those columns, at first, I thought they were just decorations similar to fountains or some kind of religious devotion. The inscription sparked my curiosity and reading nomination document not only gave a good explanation of these columns but a fine reason why this specific column in Olomouc be selected by UNESCO. Similar to many travelers who visited central square of Olomouc old town, the sheer size of the column was really eyes catching since there was no buildings nearby to steal attention making the column to be the true center of the square. 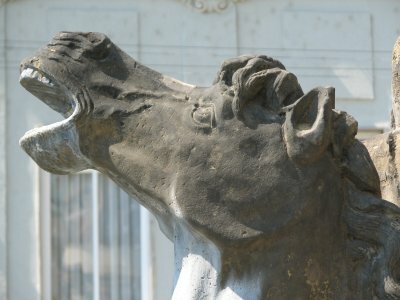 Attracted by its dominance, it was a duty to directly walk to the column to see the details. The column was adorned with many beautiful statues, too bad that there was no explanation and because of great height, the upper part was a real neckache to see, use camera to take zooming snapshot was a real help. Despite the immense size and great details to admire, without some experts to explain, it was really hard to keep people to admire it more than ten minutes in my observance from nearby café! Maybe this kind of column was nothing special in this region, its superlative size may give a curiosity and get some attention but it was still a typical plague column. Nevertheless, Olomouc’s column, in my opinion, was a great sight to see. It is a true granddaddy of the plague column and also the smallest World Heritage Site in the same time! With a great and beautiful town of Olomouc, visiting the column in both day and night especially in early morning was truly a worthwhile experience in Moravia. We entered the town square from the east and the first impression was stunning. The Holy Trinity Column dominates the whole square and is higher than the surrounding houses. I had already seen monuments of this kind in other Czech and Austrian cities and was also 'forewarned' by the previous reviews, nevertheless I was amazed. It is not only the sheer size that makes the column unique, but also the large number of sculptures, light-bearers and decorations. However, the appearance is harmonious and not exaggerated or disproportionate. Of course, you can visit this site in about 10 minutes, but on closer look the first strong impression is even enhanced. We walked several times around the column and each time we noticed some more details. A table at the restaurant Caesar is perfectly suitable to admire the whole scenery of the square and the column. In the warmer months, there are tables just in front of the town hall. When visiting a town, I always like to get an impression from the bird's eye view. In Olomouc, I can recommend to climb the tower of the St Maurice Church close to the town square. I clearly can support the recommendation of Ian Cade to spend more time in Olomouc. First, because the Holy Trinity Column is worth seeing at night. And second, because there is a real good night-life with nice restaurants and pubs in the cobbled streets of the old town and the university quarter. 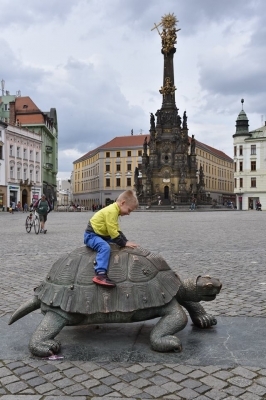 A note for those who wants to travel to Olomouc in near future and also wants to see the Baroque fountains and the Plague column: in May 2012, there were construction works at the Dolni namesti. The building site extended almost over the whole square and we could view the Plague column and the two fountains only from distance. And the Mercury 's fountain was completely wrapped with plastic foil because of the renovation of a nearby building. This seems to be the smallest World Heritage Site anywhere, and it takes about 2 minutes to see everything. It is very pretty and big, but the only justification for inscription I can see is that it is a representative example of the many plague columns all over Central Europe. There is a famous one in Vienna, and even one in my small hometown in Austria, which is maybe half the size of the Holy Trinity Column. 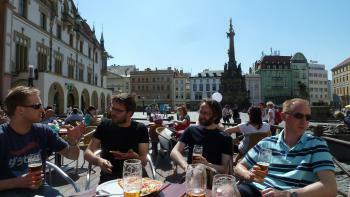 The Old Town of Olomouc is really pretty, and the Town Hall next to the column is also very interesting. I think the entire city should have been inscribed instead of just the column. 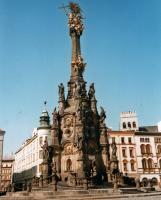 I have been many times in Olomouc and every time I could admire the Holy Trinity Column. It is a stunning hexagonal memorial column 35 m high and with a diameter of 17 m, projected by Václav Render in the begin of the 18th century, and the best example of a type of monument that you can find only in Central Europe. 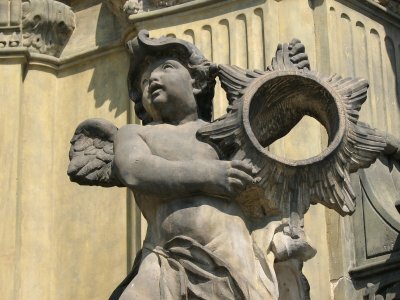 It is in the “Olomouc Baroque” style and it’s decorated with relieves and 21 religious sculptures made by Ondøej Záhner. It has a circular base with seven steeps and eighteen guard stones with a forged chain. The first level has a small circular chapel, six conical balustrades, two putti, two vases, six pedestals decorated with scrolls and achantus and six statues of saints; it's decorated with pilasters, ribbon motifs, conches and relieves of apostles. The second and the third level are similar. The 10 m monolithic pillar is decorated with fluting and acanthus motifs and has the group of the Assumption of the Virgin Mary with angels. On the top of the capital, decorated with the same motifs, is the group of God the Father, giving a blessing, and Christ with the cross placed on a globe with the Archangel Michael; there is also a star that symbolize the Holy Spirit. I liked the column also because I have seen a lot of monuments of this type but no one is of its quality. It's worth to be visited if you are in Moravia and justifies the inscription because it is the most important example of this type of monument in the world and the only one inscribed; however I think that could be inscribed the whole two main squares or even the entire centre. Central Europe's hidden treasure; Olomouc has thus far avoided all the pitfalls of Prague, Cesky Krumlov and Krakow. Despite being beautiful it is as yet off of most tourists itineraries. This may change as people start to discover more outside Prague and the latest editions of English language guidebooks are really starting to sing its praises. In the past it has received praise from a wide range of luminaries ranging from Tolstoy to REM. The Trinity Column itself sits on the main square, and is breath taking. It is the largest baroque sculpture in Europe; if you have seen any of the other Plague/ Trinity columns in Europe then this will be impressive for its sheer size. It was the first one that I saw and I was massively impressed. It is also one of the few examples to have a chapel in it, which is open one or two times a year. I was very lucky to see it open on two occasions; it is a pretty simple design inside. The column is also one of the largest at 35m and its top is impressively adorned by a gold depiction of the Holy trinity. 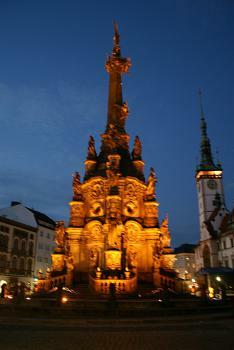 If you stay in Olomouc then it becomes even more impressive at night when it is magnificently lit up. If you just come and see the column and head back out after an hour or so then this WHS may seem a little unremarkable. As such I would recommend spending a little more time here, it is the nicest place to base yourself in Moravia, it has good transport links, and is a much more rewarding destination than Brno. The rest of the city is a maze of cobbled streets and fine edifices and also contains the country's second oldest university and this gives the city a fantastic buzz and great night life. The parks that encircle the city are nice, especially Bezarucovy Sady which gives you impressive views of the massive medieval city walls. If you have an interest in baroque architecture then the city is well worth a visit as it contains six fountains and another plague column all in this style. They were originally nominated with the Trinity Column; however it was deemed that the column was of more outstanding value on its own. Olomouc is about 3½ hours east of Prague 3 hours north of Vienna and 5 hours south of Krakow, making an excellent stop over point between them. It is also a good base for several of the other nearby UNESCO sites. It is one of Central Europe's cheapest cities and despite the outskirts being a little industrial looking the historic centre is truly one of central Europe's finest. Right in the middle of the town hall square stands the 35 meter high Holy Trinity Column, erected in honour of faith, God and gratitude for the ending of the plague in 1716. If you only want to see the column it could be done in 10 minutes but the town of Olomouc has much more to offer to the few tourists that eventually end up in this brilliant place. Filled with beautiful churches, cathedrals, castles and other prominent buildings, Olomouc is a town to linger in for a couple of days just to enjoy and celebrate the fact that all tourism in the Czech Republic seem to be stuck in Prague and so far yet not discovered the rest of this historically rich country. Olomouc is one of its true pearls and as is both a religious centre as well as a leading university town. Once you are here, don't forget to enjoy the local culinary delicacy in Olomouc – the soft-cheese Olomoucì Tvarŭžky served with butter, red onion and paprika…mmmmm! 167 Community Members have visited.